Fairly equal. Median rent prices for 1-bedroom & 2-bedroom houses for select Zipcodes in Austin, Denver & Portland Metro areas, July 2017. Currently, some of the fastest metro regions in US include Austin, Denver & Portland and they offer comparable lifestyle, job opportunities and cost of living. This chart comparing select neighborhood in these three metro regions gives a fairly good idea about the cost of living. Austin certainly looks less expensive while Denver seems to be slightly higher than Portland. 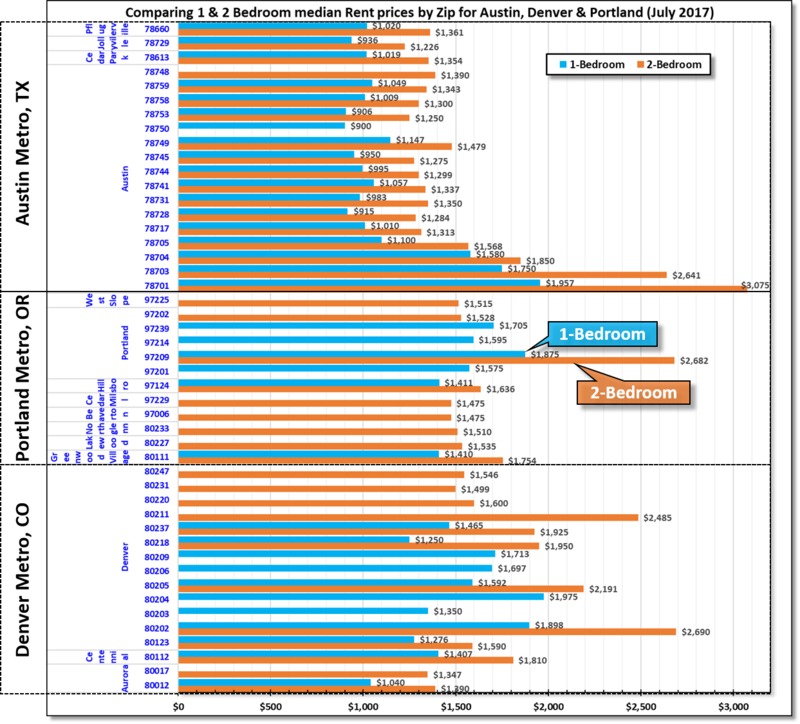 All other things being equal, Austin is better choice if one was to move there based on cost of renting. But Denver & Portland offer much more for outdoor recreation and potentially more tech jobs. They also have some of the fastest growing home prices. However, a growing young population, southern hospitality, and a vibrant music culture under the sunny skies might attract some to Austin. Source: Zillow rental data (lot of missing data is due to incomplete data set available from Zillow).